Robert Tulloch arrived in Sydney from the Orkney Islands in 1877 with virtually nothing and managed to get a job as a boilermaker with the Atlas Foundry and Engineering Company. He then branched out on his own in 1883, when he started Robert Tulloch and Company and so began an engineering dynasty that was to contribute much to the development of Sydney, New South Wales and Australia. The company started operations in Pyrmont, where it operated from 1883 to 1915. It was from this location that Robert and his staff supplied structural steelwork for the Queen Victoria Building, the Centennial Hall of Sydney Town Hall, the Eveleigh Carriage Works, Sydney Central Station, Anthony Hordern and many other notable Sydney buildings. It is also whilst at Pyrmont that the company built the huge, double-track railway bridge over the Nepean River at Penrith and the single-track bridge over the Manning River at Mt George in northern NSW. At Pyrmont too they entered the rolling stock business, with the manufacturing of four-wheel S wagons for the New South Wales Government Railways. In 1915 the company moved to Rhodes where it diversified into many fields. It pioneered the manufacture of steel tube and fittings in Australia during the depression and produced a wide range of garden tools including shovels, forks, etc. The foundry produced many items for industry and domestic use, including many tons of cast iron pipe for the Sydney water system. They also opened their own timber mill in northern NSW and operated their own timber tramway into the hills for timber getting. During WWII they made many contributions to the war effort, including the manufacture of components for the Australian Cruiser tanks and construction of ocean-going lighters for the US and Australian Armies. 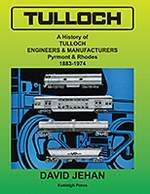 Tulloch also became a major supplier of steel-framed housing and saw several thousand dwellings constructed. In later years they also built portable class rooms for schools. In the area of rolling stock, the company built many single-deck electric carriages for the Sydney suburban system, air-conditioned carriages for the Newcastle Flyer, freight wagons and many tank cars in varying sizes and capacities. They are most noted for the design and construction of the first double-deck carriages for Sydney and the first powered double-deck train in the world. All manner of diesel locomotives were built, including diesel-mechanical, diesel-hydraulic and diesel-electric units which saw service in most states of Australia. Diesel-hydraulic railcars were also built for NSW and Victoria. Large bogie freight vehicles were a specialty, especially wheat and coal hoppers and tank cars. The company became specialists in aluminium construction and built the world's first aluminium self-supporting tank car. The company finally closed in 1974 after ninety-one years of operation. A4 portrait, hard cover book with dust jacket.